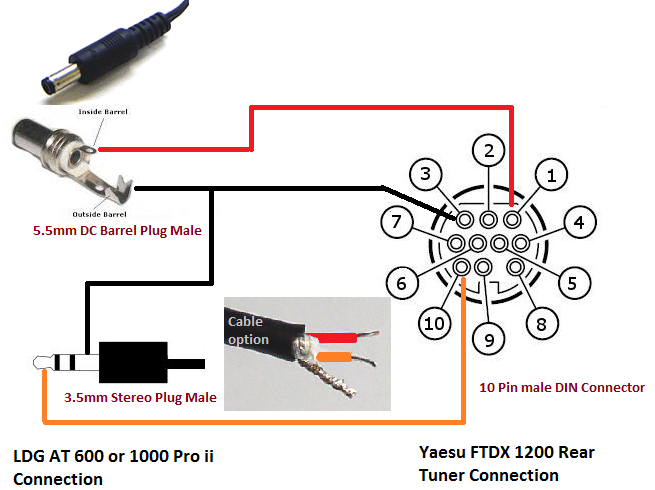 Recently, Jayan VU2EKJ referred to my other blog post here, about Icom to LDG tuner cable and enquired if such a PAC cable can be hombrewed for his Yaesu FTDx 1200 to connect with a LDG At 600 Pro ii. I did a quick google search and looks like its a pretty straightforward connection. All you need is a 10 Pin male DIN connector, 3.5mm male Stereo plug and 5.5mm DC male plug. Connect all these together with a shielded stereo cable as shown below and you should be through. As you see above, this is pretty straight forward connection. Small note, the centre ring of stereo is not connected anywhere. You will also need to form a “Y” with the wires, with split ends, one going to stereo plug and other to barrel plug. Single end of the “Y” goes to the DIN plug. This is also documented by LDG here. Do post picture of a ready cable or let me know if you face any issues, in comments below.